Which is the best digital assistant: Siri, Cortana, Alexa or Google Now? I'm hiring a new assistant. Requirements: must handle scheduling, take dictation, have flexible hours, be able learn on the job, and lack any corporeal presence. 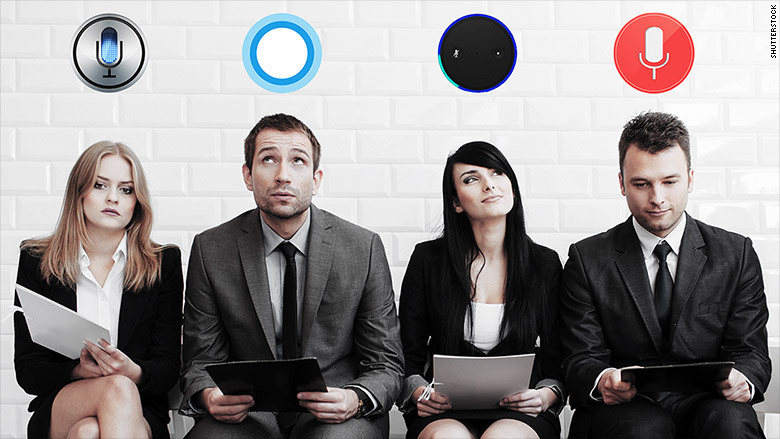 Apple (AAPL), Google (GOOGL), Amazon (AMZN), and Microsoft (MSFT) are all competing to make the best digital assistants. I wanted to choose one the old fashioned way: a job interview. I asked the applicants -- Siri, Google Now, Cortana, and Alexa -- to complete the same basic tasks, judging them on accuracy, speed and style. They rattled off weather reports, gave driving directions, told (bad) jokes and tried to field basic trivia questions. They reminded me to feed the bunny, played music, and frequently apologized for their shortcomings. Siri is the best at understanding natural language. It can pick up on multiple ways of asking the same questions, so you don't need to worry about remembering the exact phrasing for commands. Cortana is quite perky, and its location-based reminders ("Remind me to make toast when I get home") worked the best. Alexa's strength is that is isn't in a phone, tablet or computer. It is inside the Echo, a speaker you place anywhere you like. It's always listening for its name and a seriously impressive microphone can pick up commands in a normal voice from across the room. Even though it can only handle a fraction of the tasks the other assistants can, I found I actually use it more than any of the other assistants. Even though it's only to buy things, make reminders, and listen to music. It's "flash" news briefings -- a collection of news from places like NPR -- is great. To be really useful, the assistants need to work well with third-party apps. Ideally, you should be able to tell any of the assistants to execute commands in other apps. "Siri, send a note in Facebook Messenger to Ricky." All the companies are working on expanding access to third-party apps. Google and Cortana already offer some. 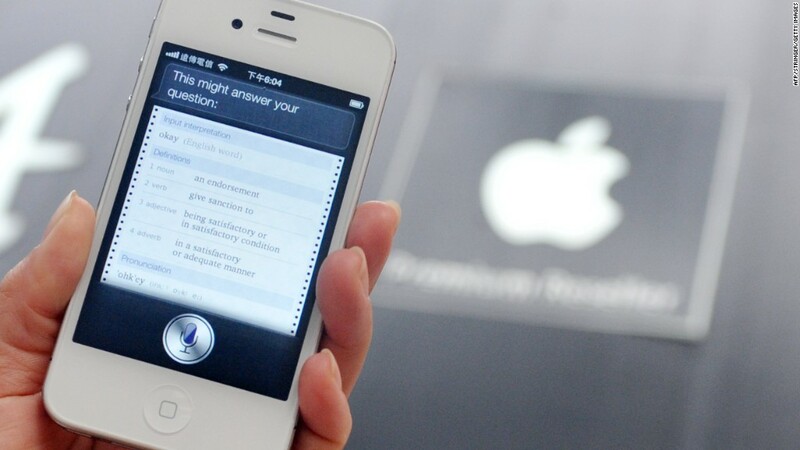 Apple is the slowest, though it recently allowed app developers to tap into Siri's code. Google Now seems to be the most likely to default to a web search -- unsurprising given that it's built around a search engine. Cortana comes on a Windows Phone (it will also work on Windows 10 computers). Alexa can't do nearly as much as the other assistants. She's a simple creature. "Where should I go for coffee?" Simple, right? Siri gets right to the point, directing you to the nearest decent cafe so you don't have to choose. All three phone-based assistants offer up a list of options, with ratings and distances. Cortana's selection was the most perplexing, not showing any of the local spots but listing every Peet's in a 4-mile radius. I would not trust it with dinner recommendations. Sweet, innocent Alexa isn't aware there's a world outside. The companies behind these assistants have invested a lot in "personality," which mostly seems to mean a weird and often hidden sense of humor. Siri's humor is a bit meta ("How many iPhones does it take to... OK, never mind."). Both Cortana and Alexa go for the classic dad jokes. "What cheese goes around a castle?" asks Alexa? "Moatzzarella." Cortana gets a bit geeker: "Don't trust the atoms. They make up everything." Google Now does not really do jokes. However, like all the assistants, it is packed with "Easter eggs" -- hidden tricks that have no practical purpose, but are good for a giggle. Ask Google Now to make you a sandwich or do a barrel roll. How well do you handle adversity? All the assistants frequently mishear or don't understand commands. It's frustrating. When in doubt, they apologize for not understanding or toss up search results, hoping the Web can pick up where they fail. There's a lot Alexa doesn't know. Sometimes it's up front and says, "Sorry, I can't find an answer to the question." But many times when it's lost it just ignores you and doesn't say a thing. This would get a real assistant fired. Absolutely. Except for Alexa, which is a prisoner in your home. Siri is pushing into the home (HomeKit), car (CarPlay) and even your body (HealthKit). Google Now might get some personality. And unlike Siri, which only works on Apple devices, Google Now works on Android, iPhones and PCs. Cortana's fate is tied to Windows 10, which Microsoft expects to be on 1 billion devices in two to three years. Cortana will also be available on Android and iOS, and might be the most-used of the bunch by 2020. The Echo might be collecting dust in a warehouse next to a few million Fire Phones, but Alexa will live on in other devices. With Amazon's reach, it could work with all variety of hardware sold through Amazon. I'll hire Google Now to handle my personal life. It's quiet and to the point, fun to use, and already knows everything about me. But I'm going to go crazy and also hire the Echo because saying "Alexa, play Prince on Pandora" from across the house is hopefully only the beginning of its powers.